If you are embarking on a floor remodeling project or larger home remodels, no doubt you have seen that hardwood flooring is a lasting trend in home décor. Exotic hardwoods offer distinctive wood grains and unusual color tones. Hand scraped wood flooring shows off a one-of-a-kind character that fits with modern, industrial, rustic and traditional styles. 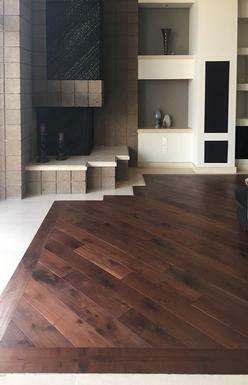 The professionals at Arizona Hardwood Supply, Inc. are the residential wood flooring specialists in the Phoenix metro area with over 30 years of experience in residential floor installation and refinishing in houses all across the Valley. Whether starting from the ground up with new construction, remodeling your home or just refreshing one room with beautiful and cost effective wood flooring, we are the smart choice for homeowners. The homeowners went in to our Gilbert showroom looking to update the look of their already beautiful South Phoenix home. After looking through our selection and checking several samples out of our showroom they ended up choosing Antique Impressions 6” Walnut Ferrera.